I can't help with much of your query, but....most every fish here on the Salt Water Texas flats has plenty of teeth. #2. One of the true "old hands" down here, who I think may have passed on by now, wrote the book on Texas flats wade fishing. 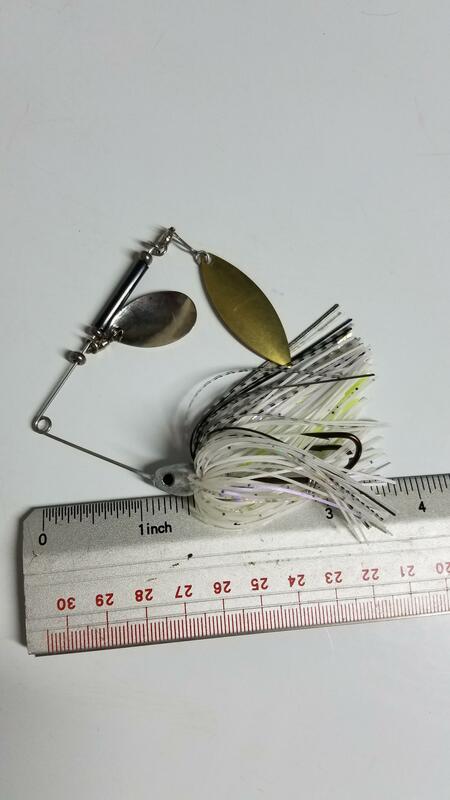 A lure that worked then, and still works today, is a small gold or silver Johnson Sprite spoon. Rudy Grieger, the well-regarded expert, used to pre-tie/rig his spoons with about a four-inch piece of light wire, tied onto a swivel. The swivel was necessary because the spoon would tangle likes without one. The wire kept Spanish Mackeral or Ribbonfish from taking his lures. If they got any paint at all, it was from a rattle can, covered in two part epoxy. Most were left in a "natural lead" color. LOL - I'll take a picture of the pattern I make for CT when I get home - other than a different head mold it isn't all that different than what you've got there. I had a guy pouring a 5/8 oz hidden head on a .045 wire. From the head to the "R" tie had to be roughly one inch. #5 Indiana blade in silver, about 5 different types/colors used in the skirt. Small surface area for hydro reduction, neutral, natural colors for the river I fish. Here's what they look like at work. Of course I don't have any of the single blade designs handy when I went looking last night. This is another one that they love, albeit a double blade. The double frog hook works well over rocky/deeper weeds, but I have single hook setups for in and around weeds that reach the surface. Regarding invasive and/or dangerous fish. This is from NJ fishing regulations. The possession or release of live, potentially dangerous fish is prohibited. These species (see Aquatic Invasive Species) include Asian swamp eel, bighead, grass (diploid) and silver carp, brook stickleback, green sunfish, flathead catfish, oriental weatherfish, snakehead and warmouth. Anglers MUST destroy these species if encountered while fishing and are directed to submit specimen(s) or photos to a Fish and Wildlife Bureau of Freshwater Fisheries biologist for verification. To reach a biologist, call (908) 236-2118 for north Jersey or (609) 259-6964 for south Jersey. These non-native species are likely to cause environmental harm to the state’s fisheries resources by outcompeting preferred game fish species. Common carp are an invasive species but are NOT classified as a potentially dangerous fish and do not have to be destroyed. I fished some northern Wisconsin lakes. The guide would take an 16/18 inch Northern Pike/Snake/Hammer-Handle...and whack it on the head..and throw it back in the lake. He called it Eagle Food. They don't like small Northerns in Wisconsin. I thought you couldn't put return a carp. That's why I went to go check it out. common carp to my knowledge in most states is now considered a naturalized fish and can be caught and release. You have other species of fish similar to carp like big mouth buffalo, smallmouth buffalo and some others that are native to most waters in the US that would support them. It's the asian carp that are invasive. There are two kinds silver carp ones that jump, and big head carp which get really big and have big heads with big mouths. I've caught and have seen others catch big heads on lures like spoons, and swimbaits. Silvers I've never gotten them to bite anything. The little baby carp do work for bait I've caught hybrid stripe/white bass on baby asian carp, as well as catfish. The problem with the asian carp is they reproduce and grow very fast. Although the little ones do a provide a food source for other fish the time that they are small enough to be a food source is much shorter than the species they over run like buffalo, various suckers, quill back and other rough fish that serve as a food source for others. I'm sure big blue cats and flatties eat some of the asian carp that are medium sized, but full grown adult carp don't have any predators to keep them in check other than humans. Hence why I bash the brains in on any I get. I hate chucking them on the bank as it always irritates me to find rotting fish littering the bank around the boat ramp. So I take mine home where they either get cleaned and cooked occasionally, or chucked into the compost pile where usually raccoons or the buzzards get them in short order. So complain about pike and musky, but be glad you don't have asian carp. I'll take a toothy musky or pike that's at least a desirable fish to many over asian carp.